Friends! I have taken an unexpected blogging break this week! Oops ;) Turns out you get really busy when your wedding is 38 days away <---- CRAZY! I've been trying to find a cute beach bag tote I can take with us to Maui on our honeymoon. 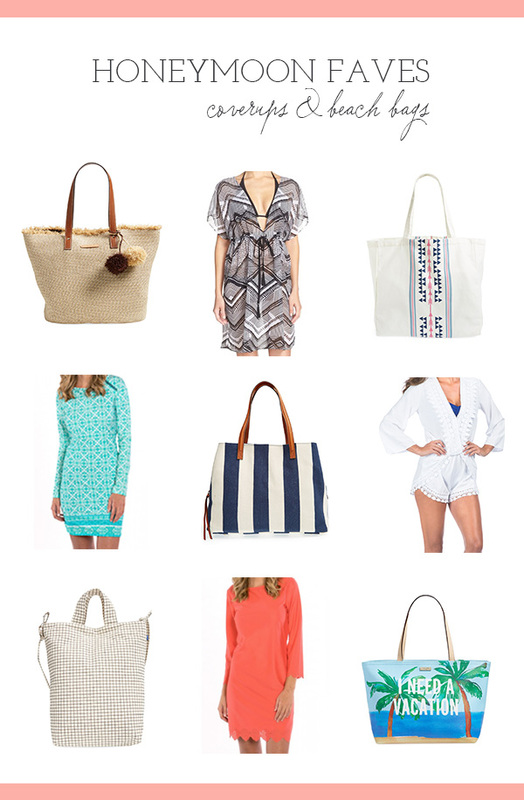 Today I'm back and I'm showing you my favorite options + some ADORABLE coverups I found during my searches. My mom is coming to visit me this weekend and come to my Michigan bridal shower. I can't wait to have her here! Sorry if things get quiet again! You can follow along on instagram. I love your wedding series! It has been so helpful as I plan my own wedding. Do you plan on doing a bridesmaids gift post? I don't remember seeing one yet. Hello, I am sure you have gotten plenty of advice about all of the amazing things to do in Maui, but I wanted to add one more! I grew up going to Maui a lot (my dad lived there). There is a restaurant called Mama's Fish House which is so incredibly special. It is just past Paia (also a wonderful place). The food is to die for and the restaurant views and decor are fabulous. Also just past there is Hookipa the famous surf spot, a great place to watch the world go by at sunset. Enjoy! Yes, Mama's is amazing! And the town it is in is so cute to walk through. You are going to love Maui!!! !